A talented character actor known for his military roles, Ronald Lee Ermey was in the United States Marine Corps for 11 years. He rose to the rank of Staff Sergeant, and later was bestowed the honorary rank of Gunnery Sergeant by the Marine Corps, after he served 14 months in Vietnam and later did two tours in Okinawa, Japan. After injuries forced him to retire from the Corps, he moved to the Phillipines, enrolling in the University of Manila, where he studied Criminology and Drama. He appeared in several Filipino films before being cast as a helicopter pilot in Francis Ford Coppola's Apocalypse Now (1979). Due to his Vietnam experiences, Coppola also utilized him as a technical adviser. He got a featured role in Sidney J. Furie's The Boys in Company C (1978), playing a drill instructor. Ermey worked with Furie again in Purple Hearts (1984). However, his most famous (or infamous) role came as Gunnery Sergeant Hartman in Stanley Kubrick's Full Metal Jacket (1987), for which he was nominated for a Golden Globe. He did win the best supporting actor award from The Boston Society of Film Critics. Since then, he has appeared in numerous character roles in such films as Leaving Las Vegas (1995), Se7en (1995) and Dead Man Walking (1995). However, Ermey prefers comedy to drama, and has a comedic role in Saving Silverman (2001). 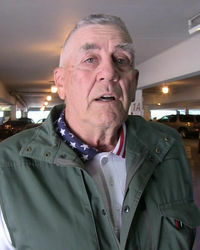 Ronald Lee Ermey continues to be one of the best character actors in the business, and you can bet that when his name appears in a movie's credits, he is going to be top notch in his role.